After almost 33 years of unbroken production, the Mercedes-Benz G-Class remains unparalleled. This was the opinion of the "Off Road" magazine readers, who voted the G-Class "Off-roader of the year 2012" in two categories – making it a repeat of last year's success for the off-road legend. The G-Class eased to victory in the "Luxury off-roader" category and defended its top spot in the "Classic" category. The new M‑Class, eligible for the first time having been unveiled just last year, achieved second place in the "Luxury SUV" and "Newcomer" categories. 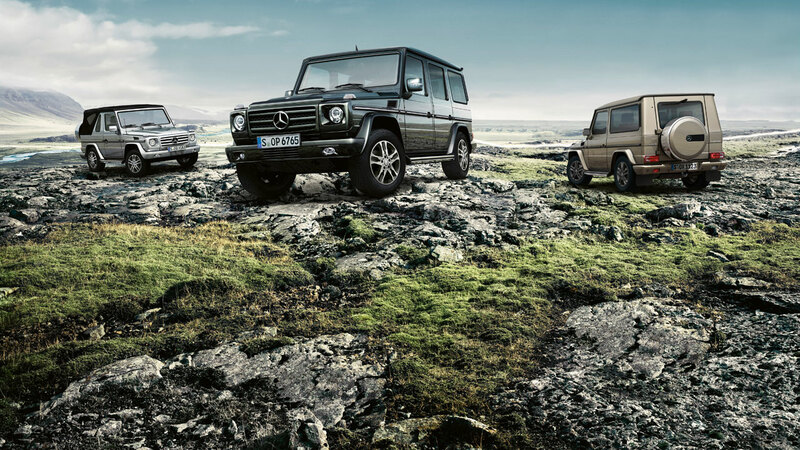 The Mercedes-Benz G-Class has been a permanent fixture in Mercedes-Benz's model line-up since as far back as 1979 and remains an off-roader par excellence. Its special position as an off-road icon is down to its continuous and systematic further development by Mercedes-Benz over a period spanning more than three decades. Hence the latest-generation G-Class features an impressive mix of state-of-the-art drive technology and high-calibre interior appointments whilst also maintaining its highly valued, hallmark attributes such as extreme robustness and outstanding off-road capability. This is already the ninth time it has won the "Off Road" magazine reader survey, giving it the title "Off-roader of the year" once more. The "G" family currently has three body variants: short-wheelbase Station Wagon, long-wheelbase Station Wagon and Convertible, which can be combined with either a particularly environmentally-friendly V6 diesel engine featuring BlueTEC technology and with an output of 155 kW (210 hp) and 540 Nm of torque, or a powerful 5.5-litre V8 petrol engine developing 285 kW (388 hp) with a torque of 530 Nm. The flagship G 55 AMG model – available only as a four-door, long-wheelbase Station Wagon – is powered by a V8 supercharged engine developing 373 kW (507 hp) with an impressive peak torque of 700 Nm. The superstar among off-roaders uses high-performance drive technology and dynamic handling control systems to deliver outstanding on-road and off-road performance. Standard equipment includes permanent all-wheel drive with a low-range ratio, the electronically controlled traction system 4ETS, three differential locks that can be engaged at the push of a button and the 7G-TRONIC seven-speed automatic transmission. Although the third-generation Mercedes-Benz M-Class was not delivered to its first customers until late autumn last year, it still managed to achieve second place in the "Luxury SUV" and "Newcomer" categories in the latest "Off Road" magazine reader survey. The M-Class impresses with outstanding energy efficiency: on average, the new models consume 25 percent less fuel than their predecessors. The fuel-consumption champion is the ML 250 BlueTEC 4MATIC, with an NEDC figure of just 6.0 l/100 km (158 g CO2/km). Further strengths of the premium SUV include exceptional safety and well-balanced ride comfort as well as excellent driving dynamics both on and off the road. What is more, the ML features permanent all-wheel drive, an array of new chassis developments and innovative dynamic handling control systems which further enhance both driving enjoyment and handling safety.